CAPE CANAVERAL — And then there were five. 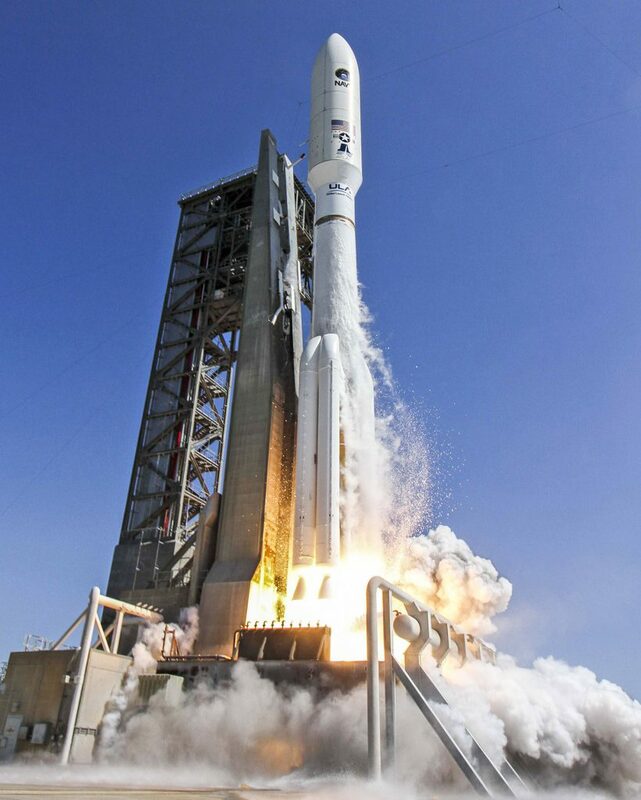 The constellation-building Atlas 5 rocket from United Launch Alliance successfully deployed the fifth communications spacecraft for the Navy’s Mobile User Objective System today to form a new rugged smartphone network for the U.S. military. “MUOS is a revolutionary system in its infancy,” said Navy Commander Peter Sheehy, principal assistant program manager of MUOS. The Atlas 5 heaved the massive payload into the proper orbit to complete the launch series, flying straight and true just like the four previous MUOS missions since 2012. MUOS No. 5 left the pad atop the 206-foot-tall rocket when the launch window opened at 10:30 a.m. EDT (1430 GMT), powering skyward on two-and-a-half million pounds of thrust from the kerosene-fed main engine and five side-mounted solid motors. Within five minutes, the launcher had climbed above the atmosphere, shed the solids, nose cone and first stage, leaving the cryogenic Centaur upper stage to perform three burns spread over three hours to loft the 15,000-pound satellite into a high-perigee geosynchronous transfer orbit. 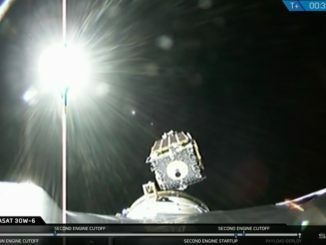 The first stage performed normally, a little “hot” even, with no signs of repeating the mixture ratio valve hiccup suffered on the last flight in March. The three-burn Centaur profile was designed for the MUOS missions because it enabled each rocket to carry about 1,000 pounds of extra payload. 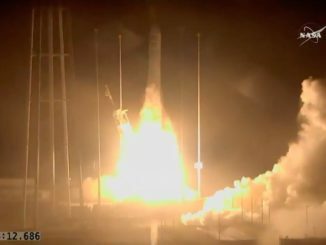 Deployment of the satellite occurred at 1:23 p.m. EDT (1723 GMT), becoming the 134th successful launch in a row for the Atlas program spanning more than two decades. “We are honored to be entrusted with delivering America’s most critical space assets to orbit and appreciate the outstanding team effort in delivering 100 percent mission success — one launch at a time,” said Laura Maginnis, United Launch Alliance vice president of Custom Services. The MUOS launches placed a combined 75,000 pounds of cargo into space using the most capable version of the Atlas 5 rocket available. Acting as cellphone towers from their geosynchronous parking spots over the equator 22,300 miles high, the satellites together generate global coverage and reach just miles shy of the poles. MUOS No. 5, the in-space spare of the system, will be placed over the Indian Ocean. 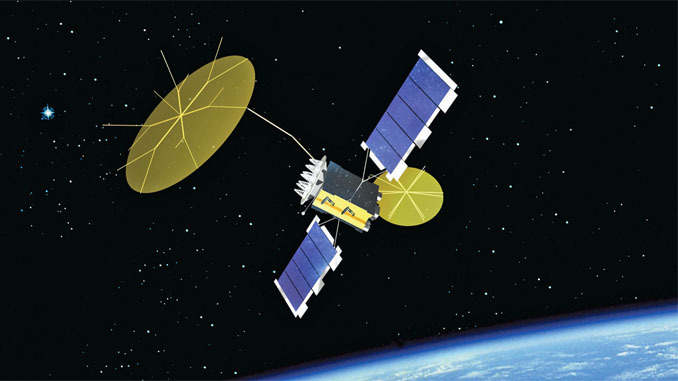 MUOS serves a dual-provider of both voice traffic currently routed by the Navy’s legacy generation, albeit aging, Ultra High Frequency Follow-On spacecraft. The first four MUOS craft are supplying UHF communications today, and MUOS 5 should join in by Christmas. But MUOS also creates a new era of mobile communications built around 3G cellular technology to relay narrowband tactical information such as calls, data messaging, file transfers and email on rates of up to 384 Kilobits per second. That advanced service will begin for combatant commanders by year’s end and expand throughout the military over the next two years as terminals are built and deployed. “As a retired Army colonel who led soldiers in theater in Iraq, I can tell you firsthand that MUOS is a game-changer,” said Mark Woempner, Lockheed Martin’s MUOS program director. Once checked out and declared operational, MUOS 5 will go into service for the legacy UHF users. The 3G-type services will be held in reserve since the satellite is a spare to replace one of its sister-craft in the future. “Like its predecessors, MUOS 5 has two payloads to support both these new Wideband Code Division Multiple Access (WCDMA) waveform capabilities, as well as the legacy Ultra High Frequency (UHF) satellite system, used by many mobile forces today,” Woempner said. The sophisticated MUOS system is designed around the commercial third-generation cellular telephone architecture to substantially increase the number of users and amount of communications that can be routed to military forces aboard ships, submarines, aircraft and land vehicles, plus terminals in the hands of troops. The overall cost of MUOS is $7.7 billion. “With the satellite constellation complete, we are committed to continuing the work with our stakeholders to deliver the full suite of MUOS capabilities to operational use for our warfighters,” said Capt. Joe Kan, Navy’s MUOS program manager. The UHF communications routed through previous Navy satellites and now MUOS provide command and control between combat leaders and their warfighters, connectivity to tactical forces, communications for Special Operations and support to rapid deployments of land, air and naval forces worldwide. MUOS also enables users to communicate with smaller “rugged smartphones” devices, unlike the bulky gear needed to talk with the Ultra High Frequency Follow-On satellite fleet. With the older satellite system, users had to be stationary with an antenna positioned directly toward the satellites to send out information. “You won’t have to come out from under cover to make a call anymore,” Woempner said. MUOS will enable communications on the move, enabling users to send and receive data, make calls and watch video anywhere. “With that smartphone comes the ability to introduce new applications, new ideas that haven’t yet been envisioned by the warfighter. 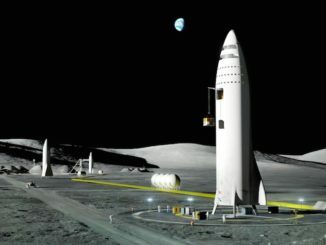 It is exciting to think about over the next 10 years about how this system is actually going to be used versus how it was envisioned to be used by the original designers,” said Jim Parsons, the Navy program office’s technical director. Two gold mesh antenna reflectors, built by Harris Corp., are the heart of the MUOS communications payload. Coverage to legacy users will transmit through a 17.7-foot-diameter reflector on the craft and the advanced, multi-beam features of MUOS to significantly increase the transmission capacity over the Navy’s previous satellites will use a large 46-foot reflector on the satellites. In their launch configuration atop the Atlas rocket with the two power-generating solar arrays stowed on the sides and the umbrella reflectors folded up, each MUOS stood 22 feet tall, 12 feet wide and 6 feet deep. The craft were built on Lockheed Martin’s A2100 satellite design used by dozens of previous communications spacecraft. Since 1978, Atlas rockets have conducted 24 launches with communications satellites for the Navy. The MUOS No. 5 launch was the 63rd Atlas 5 launch and the third this year. For United Launch Alliance, it marked the 108th flight for the company and the fifth of 2016. Next up is the secretive NROL-61 mission launching July 28 aboard an Atlas 5 from the Cape. The unclassified launch period extends from 8 a.m. to 12 noon EDT (1200-1600 GMT). Seven more Atlas 5 flights — with a mix of national security, civil and commercial payloads — are planned through the end of the year.